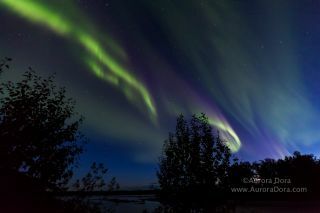 An image of the Aurora Borealis, taken by night sky photographer Dora Miller (also known as Aurora Dora) on Aug. 22, 2015, in Talkeetna, Alaska. Space weather events that have been building over the last week continued to affect Earth early this morning (Aug. 28), increasing the possibility of amped up auroras around the planet's polar regions. A string of space weather occurrences this week has led to some beautiful aurora displays, such as the one seen in the picture above. But showers of powerful particles from the sun can also cause problems for power grids, satellites and astronauts, so government agencies are keeping a close eye on the activity. The National Oceanic and Atmospheric Administration (NOAA) issued a G3 Geomagnetic Storm Warning, valid through 3 a.m. EDT (0700 GMT) today. The rating scale for geomagnetic storms ranges from G1 (minor) to G5 (extreme) with G3 considered "strong." NOAA also publishes a map of aurora forecasts based on solar activity. Solar storms and geomagnetic storms are caused by explosions of particles from the sun, as well as the steady stream of particles called the solar wind. The so-called "K-index" is also used to characterize how severely a storm is affecting Earth's magnetic field. NOAA's Space Weather Prediction Center (SWPC) regularly updates its Web page to show the K-index value on an hourly basis, so citizens can see how a solar storm is affecting the planet. The K-index currently shows a rise in activity in the Earth's magnetic field over the past three days. The "unrest could continue for another day," according to Spaceweather.com. NASA released a statement earlier this week about a mid-level solar flare that peaked at 3:33 a.m. EDT (0733 GMT) on Monday (Aug. 24). Solar flares release high amounts of X-rays and additional energy into space, but they do not cause solar or geomagnetic storms unless they are associated with a coronal mass ejection (CME), which spew clouds of particles. CMEs and the particles in the solar wind can cause reactions with atoms in Earth's upper atmosphere that create the light displays known as the auroras.